Tried to do a lot of casting these past few days, but for some reason it didn't want to turn out. For some odd reason melted silver was "spitting" all over the place while pouring and never made it's way to the mold. This never happened before so I'll need to find out what the problem is. I am sure some of you can relate to days when your ideas spin out of control! Well, if I could have a talk with my muse I would tell it to come visit me when I'm behind the bench and not while driving or sleeping. I always think that I will remember all those ideas, but to be honest, most of them disappear when I don't sketch them down immediately. I do keep a sketchbook at my bedside table, however, most times I am so groggy that by sketching down a design in the middle of a sleepy state of mind I wake up and can't go back to sleep. Well well, we just can't have it all. I do find it extremely fascinating how it all works. 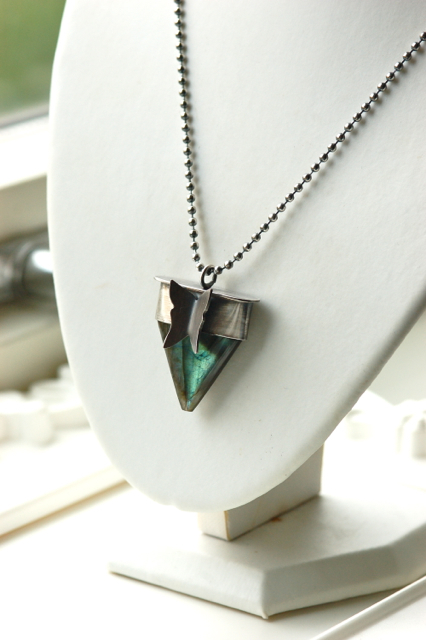 The design for the labradorite piece below came to me while driving to Oslo. I stopped at the next gas station, took my iPhone and sketched the design before it had a chance to escape me again. I had this stone for quite a long time and didn't know how to incorporate it into a design. It doesn't have a flat back and the only option would be ( with the tools I have available ) to either wire wrap it or like I did, cap it. 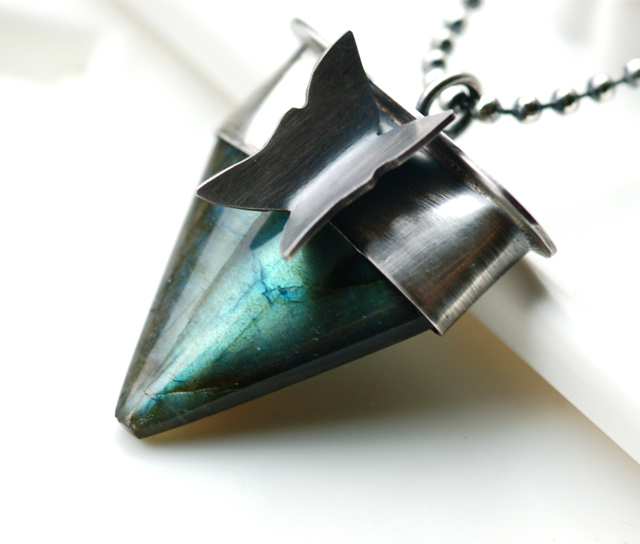 I am so happy with the outcome and glad that I was able to use this gorgeous blue-green flash labradorite in a unique design. Rosetta Jasper Cocktail Ring in Sterling Silver. Mystical Lotus Leaf Necklace with Red Garnet. Available here. Lipstick colored jasper druzy set in sterling silver. 14 carat gold granules grace the textured baseplate. Available here. Custom order for a delightful customer from Finland. Sage Amethyst set in sterling silver. Stars Ring with red garnet. Inspired by my late night walks. Available here. And lastly a picture of my messy bench which, no matter how much I clean it never stays organized for more than a couple of hours. It's hopeless. Hope your week was filled with a good dose of joy and laughter! 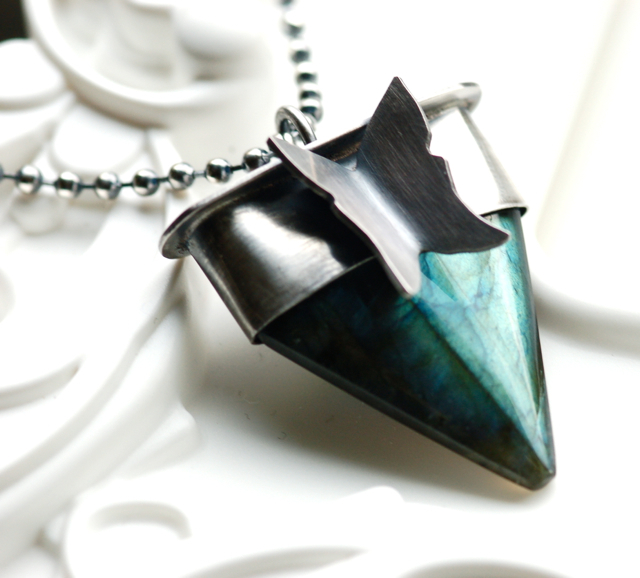 That labradorite is just so simply stunning ~ I am sure it will fly out of your shop (or should I say flutter ;) ) Your desk is tidy in comparison to mine ~ at least you can see the top lol!! What do you use on your iphone to draw/sketch?? I was a little unsure if I should really reveal my messy work space to the world..lol, but sounds like I'm not alone with being a messy worker? :) This picture was actually taken on a good day. I'm just very visual and like to have stones and other components around me to spark an idea. I use the Adobe Ideas app. It works really well when you need to doodle down something quick. lol me too on working better with a messy desk! 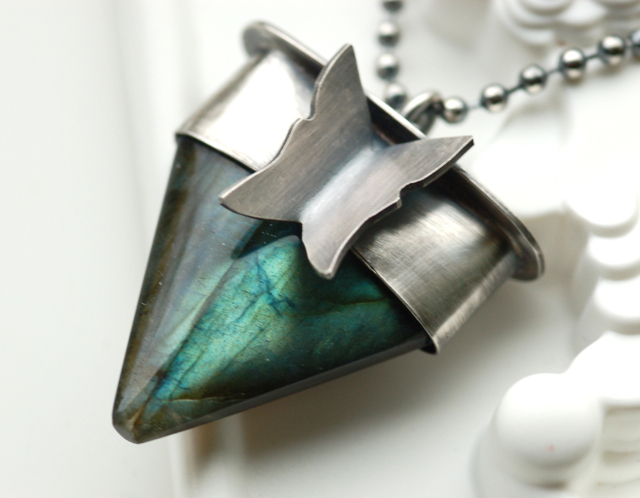 I love the Labradorite pendant too!!! The lab necklace is stunning!